Editor's Note: The following is an update on the progress of the 50 Flags Veterans Memorial that was sent out earlier this year. Donations are still being sought to make this project in Shickley a reality. Please read on. It also offers the opinions of Shickley Sons of the American Legion Post 164 members and not The Nebraska Signal. In January of 2016, the Shickley Sons of the American Legion Post 164 decided to build a Veterans Memorial in Shickley. It will be located on main street, west of the Community Center. The idea took hold pretty quickly within our group and a committee was formed specifically for this purpose. We started talking with other towns that had already built memorials, went online and looked at a lot of memorial pictures, talked with state and national VFW and Legion offices, and came up with a plan. We introduced the plan in a brochure enclosed in the 2016 alumni mailing. When we were planning the memorial, we wanted to make sure that it would be something that everyone would be proud of. When talking to the other organizations and towns, we would hear “you have to go see the one in Thistown, or Thattown”. Well, we wanted Shickley to be on that list. We wanted to be sure that people would say, “you have to go see the memorial in Shickley”, instead of, "I didn’t even know Shickley had a memorial”. When you include the “WOW” factor in a project, it naturally adds cost, but our veterans deserve the best. The project was originally estimated to be around $280,000 but that has changed significantly for a couple of reasons. 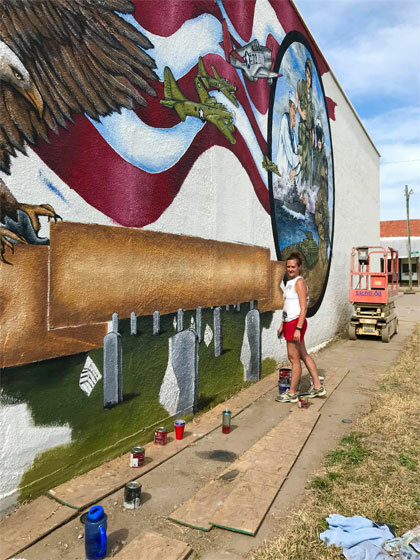 The first change and addition to this project is that Chris and Cassie Schlegel have given us permission to paint a mural on the south wall of their business, 5 Loaves Market, directly north of the memorial site. Many thanks to them for this opportunity as the mural will definitely add to the “WOW” factor of the memorial. The wall was cleaned and primed last fall in preparation for painting. Sarah Swartzendruber will be painting the mural in the summer of 2018. For those who are not aware, Sarah is the artist who painted the mural of Shickley’s history on the wall north of the Community Center. Also, we are planning to do some sidewalk replacement under the mural for safety reasons. This project is a small part of the cost increase but will add to the memorial area. The main reason for the cost increase is that the company we were working with, River Valley Memorial (RVM) of Auburn, backed out of the deal. We picked RVM to help with the design and to supply the granite for the memorial because they have been involved with five other veterans memorials in southeast Nebraska, including the Nemaha County Veterans Memorial in Auburn. Originally, finding a company that was somewhat local, and that has been involved in granite work beyond just grave stones, was a little bit of a challenge. Last July we decided to start construction of the project. We had raised a little over $240,000 of the $280,000 needed. We wanted to have all the dirt work done and all the concrete poured before winter weather set in. Then, as soon as all funds were raised, we would order the rest of the granite and finish the memorial. Meetings were held so that everyone was on the same page when moving from the design to the construction phase of the project. River Valley Memorial, JEO Consulting, who does the Village of Shickley’s engineering work, and Steve Ackland, the concrete contractor for the memorial, were all present. JEO Consulting, pulled core samples of the soil on site so we could begin ground work and get the area a solid base that is ready for construction. We ordered the granite foundation caps from RVM and were informed that it would take three months to get these caps. These foundation caps would be installed on top of the footings and then concrete would be poured flush with the surface of these caps. RVM wanted to use these foundations caps to provide a perfectly smooth and level surface to set the above ground granite slabs on. On October 20, the granite foundation caps were delivered. Upon inspection, we found different finishes on the surfaces of the caps. Some surfaces were smooth, with almost a polished feel, while others had milling marks still visible. The edges of the surfaces were also different. Some had a sharp, square edge, while others had a beveled edge. One piece had been milled with a concave edge. There were deep scratches in two of the surfaces. Obviously, we felt this was not acceptable. A call was made to RVM to discuss the problem, and a meeting was scheduled for the next day for RVM to inspect the granite. Upon viewing the granite, RVM argued that this was not a problem as the granite caps were “just taking the place of concrete.” The caps were only used to supply a smooth and level surface and that the appearance was not an issue as only three inches of the cap would be visible on each side of the uprite slabs. Our viewpoint of the defects on the delivered granite was slightly different. When you are installing granite, and paying for granite, it should have the quality and appearance of granite. The following week, we had a couple of phone calls with RVM, sent a couple of emails, and traded a couple of text messages trying to resolve our differences. On Friday, October 27, 2017, we received an email from RVM stating that RVM would be “resigning from any commitment to this project”. Their reasoning, they felt we had too high of expectations. Following the resignation of our supplier RVM, Speidell Monuments out of Lincoln was contacted and they knew of no one except RVM who had experience with veterans memorials. Fortunately, RVM had put us in contact with a company out of Minnesota, Artistic Stone & Concrete (ASC), that specializes in memorials of all types. We had already contracted them to set the 50-foot back wall. We called them for suggestions. Mike, the general manager of ASC, informed us that there are only five granite suppliers that he feels can give us the product and artwork we are looking for, one of them is the company that RVM uses. That company will not give a bid because of their association with RVM. The other four suppliers are all around $100,000 higher for the granite that was specified in our original design. Mike has agreed to continue helping us with the project. Due to these changes, our project will now cost between $380,000 and $400,000. As of March 15, 2018, we have raised $257,955. The committee has discussed our options moving forward. We feel that these donations were given with the intent that we were going to build the memorial as proposed. We do not feel it to be ethical to downgrade the memorial. Therefore we will continue fund-raising until the required amount is raised to complete the project. 1. The Shickley Community Foundation has pledged $68,000 over the next five years. 2. We have received ten $10,000 donations. 3. Five benches have been purchased at $2,500 each. 4. 29 veteran portraits / names engraved at $1,000 each. 5. 57 veteran names engraved at $200 each. 6. Five of the $250 donor pavers have been purchased. 7. 33 of the $500 donor pavers have been purchased. 8. About $20,000 in miscellaneous donations. It is important to understand that this memorial isn’t just for Shickley veterans. This memorial is to honor ALL veterans. It doesn’t matter if they have ties to Shickley. We have veterans names from Omaha, Beatrice, Ong, Geneva and obviously several from Shickley. That is why we have named it the “Fifty Flags Veterans Memorial”. As of March 15, we have 57 names to be engraved in the name slabs and 29 portraits to be engraved in the wall. Our goal is several hundred names and another 21 portraits. We live in the greatest country in the history of the world, and we owe that to our veterans. We hope you want to be a part of this memorial and help out financially. This memorial will be here for hundreds of years for several generations to see. Incidentally, we will leave room so future veterans names can be added. Enclosed is a brochure explaining the memorial. It also includes the forms for donations. Please strongly consider contributing in support or honor of a veteran in your family or just in support of the project. It is the least we can do for the sacrifices made by all who have served in the military to maintain our freedom. With your support, the project will be able start later this year. Feel free to pass this on to others who support and are interested in honoring the veterans. God Bless our Veterans, and God Bless America, Shickley Sons of the American Legion Post No. 164. Editor's Note: Contact any Shickley SAL member for more information on this project. Wade Walters at 402-759-1831 is a good contact for information. Donations are being accepted through the Shickley Community Foundation-Veterans Memorial Fund, PO Box 193, Shickley, NE, 68436.